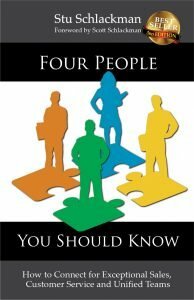 – Determine their personality color (how to communicate with them effectively). – If the answer seems to focus around people, in the organization or customers, they can be Blue. – If it focuses mostly on financial aspects of the solution, ROI, and the impact on the bottom line to the company; they would lean towards the Gold personality. – If you receive many questions on the technology, details of the functionality, and future impact to the company’s direction; that would indicate Green. – Lastly, if they emphasize a competitive focus, gaining market share, and viewing the purchase as a win for them; they can be Orange. These are three generic questions that combined with “what they need” provide a blueprint for building your customer relationship. They are “customizable” to your specific business offering. Further, until you know which personality color you are dealing with; it is a good practice to just ask questions and listen to answers (both the “what” and the “how” of their answer). But these questions also aid in revealing a customer’s primary personality color. Let’s look at some responses for each of these questions for the four colors. – Remember, if the discussion focuses on people in the company, or on customer service, the customer can be Blue. If change is a challenge or they’re concerned about employee morale, it would also lean towards the Blue. If the conversation is focusing on organizational stress and conflict, this would be another ‘Blue’ hint. Basically, a Blue is concerned about the well being of others. – A Gold personality will see their greatest challenge as meeting a timeline or a financial milestone. They might worry that the impact of change can cause disruption. A Gold might ask themselves, “Will the rest of the management team see eye to eye on the solution” and “will it further company goals?” Basically, a Gold is concerned about the financial priorities of their company. – The Green personality probably will answer with multiple challenges. They will be interested in finding “the best solution to the problem”. You will get responses that include several ‘objectively considered’ alternative solutions, with ‘plus and minus implications’ around each solution to that challenge. Greens typically have concerned opinions around technology choice and challenges about integration of existing systems. Listen for debate on how solving this challenge might impact the company’s future. Basically, Greens are concerned about being right. – The Orange personality will express their challenges in more personal terms. Listen to see if an adversary or competitor is identified where the challenge is to win against them. Oranges will worry about convincing others that their recommendation for the solution is correct: “Is there a strong likelihood of success choosing this?” or “Can this be implemented the quickest?” Basically, the Orange is concerned about being best. – Again for the Blue personality, this focuses on people and relationships. Making the employees job less stressful and improving morale are critical. – Gold’s priorities will lean to financial goals and to following existing process. – Greens will focus on technology changes and breakthroughs. – Orange will be speed to completion. They want to get it done fast in order to get the reward to them and their people as quickly as possible. Priorities might change with the Blues and Greens while Oranges and Golds are usually firm with theirs. An Orange will have a strong sense of urgency to their priorities, while a Blue will be cautious, a Green will need ‘more time’ to be sure, and a Gold will have set a timeline to achieving their top priority. – Blues approach a solution by seeking consensus from all that will be involved. They evaluate direction as a team and make their decision as a team. – The Gold’s approach is laid out in a formal plan. It includes a schedule that will lead to the implementation of the solution. Golds issue directives and will delegate assignments to others. – The Green’s approach will be extremely thorough. They will flag conditionals to watch for and alternatives responses to meet these. The Green approach is never cast in concrete. – The Orange approach will be easy to understand and most straightforward. Oranges like to go from point A to Z as fast as possible, spending the least amount of effort and expense in the journey. There are other questions that you might ask. Remember to listen to their answers and take guidance from the clues communicated by the customer – when openings occur, probe deeper into their challenges and into their view of “their” situation. We can more easily influence each sale if we understand our customer’s personality and its perspectives.